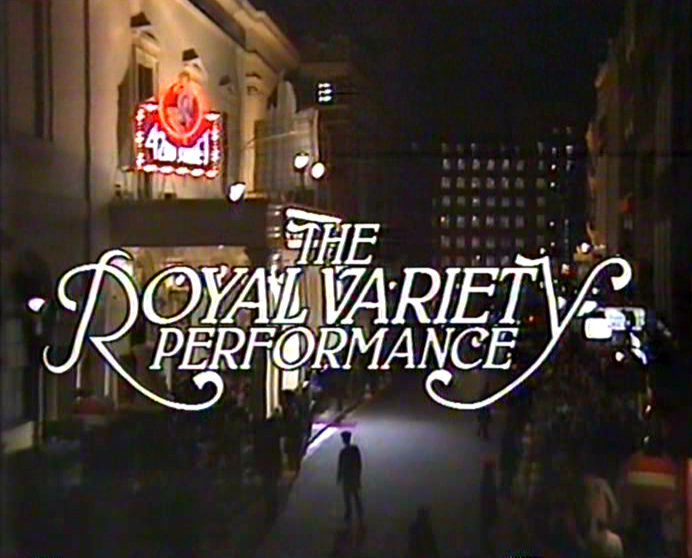 This 1985 production was held at Drury Lane in the presence of Her Majesty Queen Elizabeth II and Prince Phillip. Stars of stage and screen perform musical numbers and variety acts to raise money for the Royal Variety charity. Ronald Allen, Don Ameche, Michael Aspel, Lauren Bacall, Colin Baker, Simon Bowman, Sarah Brightman, Geoffrey Burridge, Danielle Carson, Roy Castle, Joan Collins, Margaret Courtney, Tudor Davies, Patrick Duffy, Fred Evans, Alice Faye, Robert Hardy, Rolf Harris, Russell Harty, David Healey, Celeste Holm, Michael Howe, Gloria Hunniford, Stephanie Lawrence, Jan Leeming, Rula Lenska, Maureen Lipman, Ron Moody, Dame Anna Neagle, Paul Nicholas, Sarah Payne, Tim Pigott-Smith, Su Pollard, Beryl Reid, Liz Robertson, Martin Shaw, Jean Simmons, Wayne Sleep, Nichola Treherne, Frankie Vaughan, Amanda Waring, Derek Waring, , Dennis Waterman, Elisabeth Welch, Doreen Wells, Iris Williams , Simon Williams, Gary Wilmot & Norman Wisdom. The companies of 42nd Street, Guys & Dolls, Seven Brides for Seven Brothers and Are You Lonesome Tonight? Info: Joan introduced two sections; one featuring highlights from the above companies, followed by a tribute to the late, great Fred Astaire. 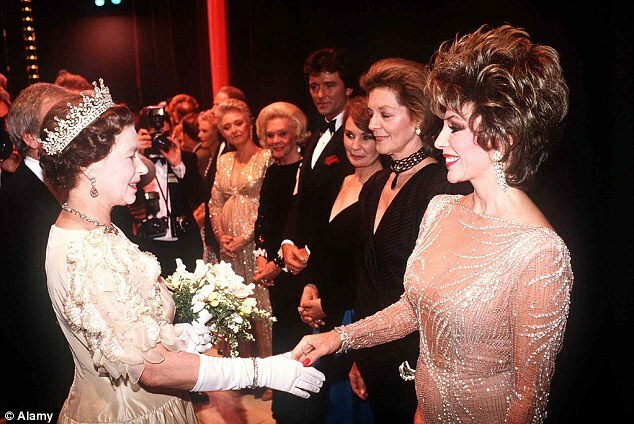 Info 2: At the time of this Royal Variety Performance Joan was successfully playing Alexis in Dynasty. 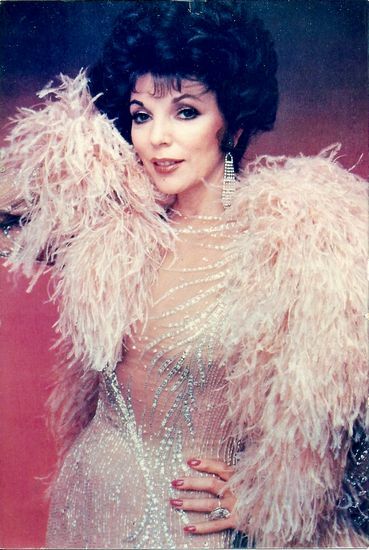 As she entered dressed in a spectacular dress and feather boa, the orchestra strikes up the theme to English soap opera, Coronation Street, Joan waving her hand in protest walks off and the orchestra change the music to the Dynasty theme. Joan comes back on stage and says, "Thats better ...... I didn't think I looked like Hilda Ogden"
Info 3: It would be 32 years later that Joan appeared again at the 2017 Royal Variety Show.